Team India cricketer Rahul Dravid has offered to step down as captain of the Indian cricket team. "I have nothing to say as of now," Dravid told the news channel Times Now . According to reports, Dravid met BCCI President Sharad Pawar on September13 and expressed his desire to step down as captain. Dravid also said that he needn't be captain for the upcoming Australia series. Meanwhile, sources close to the BCCI have revealed that Sachin Tendulkar is likely to be offered the reins of the both ODIs and Tests sides. 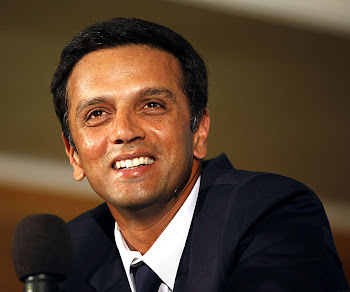 BCCI’s Prof. Ratnakar Shetty confirmed Dravid’s offer to resign as skipper of Team India. Shetty told Times Now , “I can say that it did come as a surprise. He will play Australia Test and ODI series” “It’s for selectors to pick Dravid’s successors,” added Shetty. Nevertheless, Dravid told BCCI that he will always be available as batsman for Team India. Dravid’s resignation has come as a surprise to the cricket fraternity. Sourav Ganguly expressed shock on his resignation. Team India manager Chandu Borde also said that there was no prior indication of Dravid’s resignation. Former Indian cricketer Bishen Singh Bedi too expressed shock to Dravid’s resignation. Bedi said, “I hope this is not a desperate move to get out of responsibility.” “I hope Dravid has considered the pros and cons before resigning,” he added. The BCCI will make the big decision to decide on Dravid’s successor on September 18. Rajiv Shukla, BCCI vice-president, said there are quite a few options available. Shukla said the board respects Dravid’s decision. Although Dravid had offered to step down after the 2007 World Cup, his batting came under scrutiny during the recently concluded England tour.